Kickboxer is a 1989 American martial arts film produced and directed by Mark DiSalle, and also co-directed by David Worth, and starring Jean-Claude Van Damme and former world kickboxing champion Dennis Alexio. The film was released in the United States on September 8, 1989. 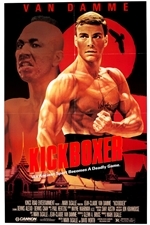 The film is considered to be a cult classic and one of the definitive works in Van Damme's movie career as a martial artist. It was so successful that it spawned several sequels.